This blog post was inspired by a Time interview with Sir Ian McKellen, who plays Gandalf, the wizard who… if you are following this blog, you already know. 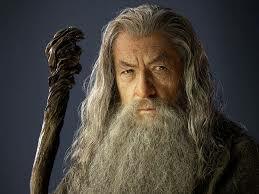 It is a fascinating interview given that J.R.R Tolkien was Catholic and McKellen is gay. Timely: the difference between the making of The Hobbit and Lord of the Rings is that Peter Jackson now wears shoes. 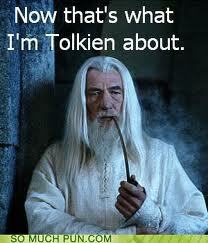 One of the questions asked of McKellen is what would he ask Tolkien if he could meet him. This got me thinking: I have already shared that I think a lot of Tolkien and Oxford, and The Inklings Club. So, if you are up there in Writer’s Heaven, quaffing on an ale or puffing your pipe, there is a student down on earth trying to emulate your literary work with a few questions. 1. Did you ever get embarrassed or try to hide your fantasy writing from your academic peers? 2. Did World War 1 provide you with the imaginary and emotional background for Lord of the Rings? 3. Why Hobbits? Who is your favorite character in either The Hobbit or Lord of the Rings? 4. If you were writing either LOTR or The Hobbit today, would you change anything? Different ending? 5. What do you think of the movies? 6. Is Peter Jackson out-of-line to make such radical changes to The Hobbit as including a character who is not from the book? 7. Who is your favorite fantasy author? 8. I know the story of how the first line of The Hobbit came to you (the blank academic paper you were grading), but how did you really come to write a fantasy series? What questions would you ask the greatest epic fantasy writer of all time? Alon Shalev is the author of the 2013 Eric Hoffer YA Book Award winner, At The Walls of Galbrieth, the sequel The First Decree, and Ashbar – Wycaan Master Book 3, all released by Tourmaline Books. Shalev is also the author of three social justice-themed novels including Unwanted Heroes. He swears there is a connection. More at http://www.alonshalev.com and on Twitter (@elfwriter).